Sunter Ltd are proud to be the recipients of this prestigious award. Working with Carillion over the last 10 years has enabled us to give many trainees the opportunity to learn new skills and enhance skills that they already have acheived with Carillion in a real working environment. Sunter Ltd are committed to on-going training to ensure the future of the Construction Industry, we feel that by putting in time, effort and resources with trainees will pay back 10 fold with a trained and competent workforce. 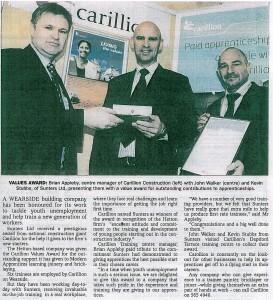 The above picture shows Mr Kevin Stubbs (Company Director) and Mr John Walker (Health, Safety & Environmental Manager) receiving the Award from Carillion Centre Manager Brian Appleby.